The governor and other state officers moved into the new capitol building on November 9, 1894. Designed by Elijah E. Myers and reminiscent of the Untied States Capitol, the building contains Colorado’s Hall of Fame, or Circle of Fame as some call it, displaying images of sixteen individuals who made significant contributions to Colorado’s history. 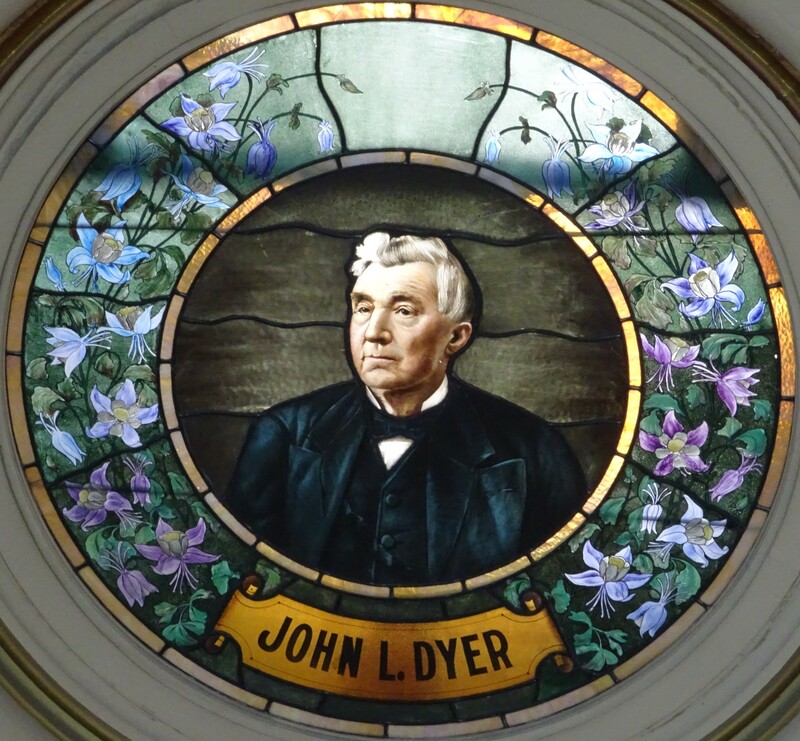 Fifteen men and one woman were honored with a stained-glass display in the dome of the new Capital Building. A description of each of these individuals is listed in a plaque placed across from their stained-glass window. The following shows each of the individuals in the Hall of Fame along with their image. James William Denver served as the Governor of the Territory of Kansas, a federal Commissioner on Indian Affairs, and as a U.S. Representative from California. 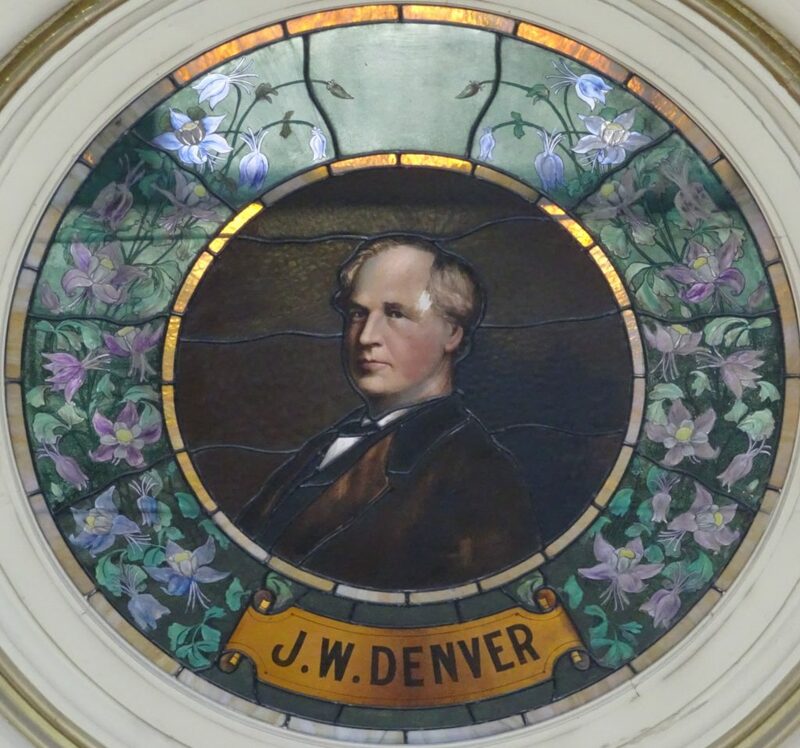 Although he only visited Colorado a few times, the City of Denver is named in his honor. William Gilpin served as the first Governor of the Territory of Colorado from 1861 to 1862. As an explorer, military officer, and politician, he aided in the expansion of the United States in the West. William Byers was a U.S. deputy surveyor charged with surveying many western territories before coming to Colorado. In 1859, he launched the Rocky Mountain News, which was published in Denver until 2009. 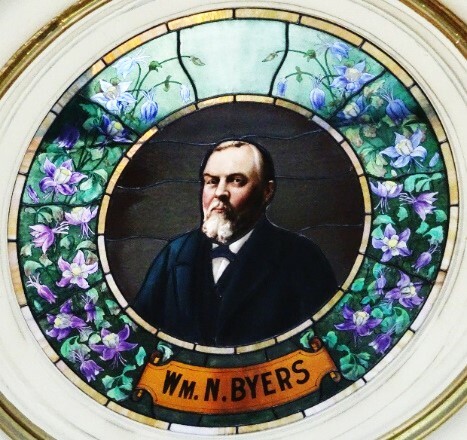 Byers was the editor of the newspaper for 20 years. General William Palmer was a prominent railroad builder whose projects included the Denver and Rio Grande Railroad, the first narrow gauge railway in the United States. 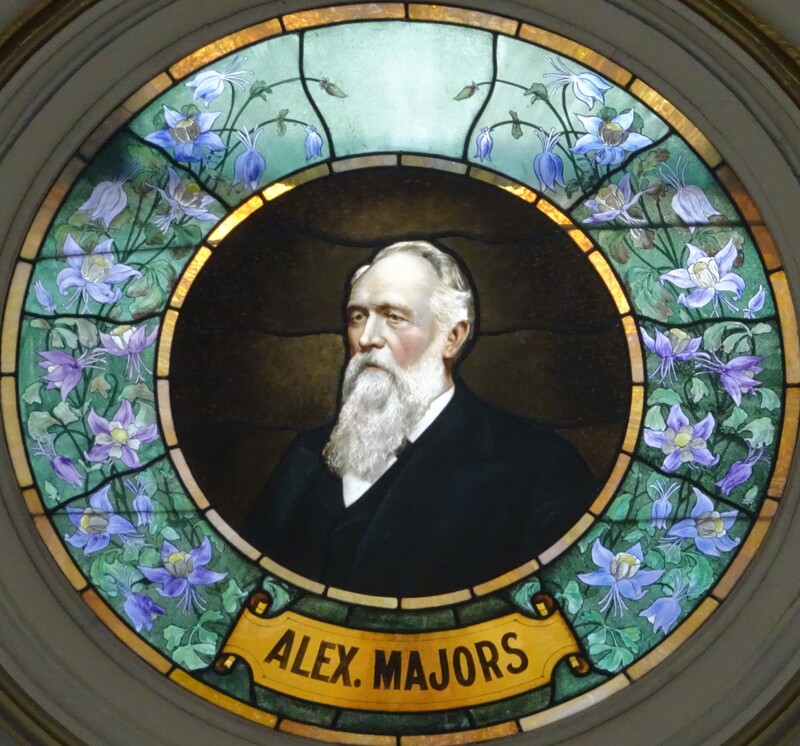 He founded the Town of Colorado Springs and later helped establish Colorado College. Chief Ouray was the Chief of the Uncompahgre Tribe of the Ute Nation. In an effort to preserve Ute land in the San Juan region, he negotiated treaties that were later broken when the U.S. government forced the tribe to relocate to Utah. 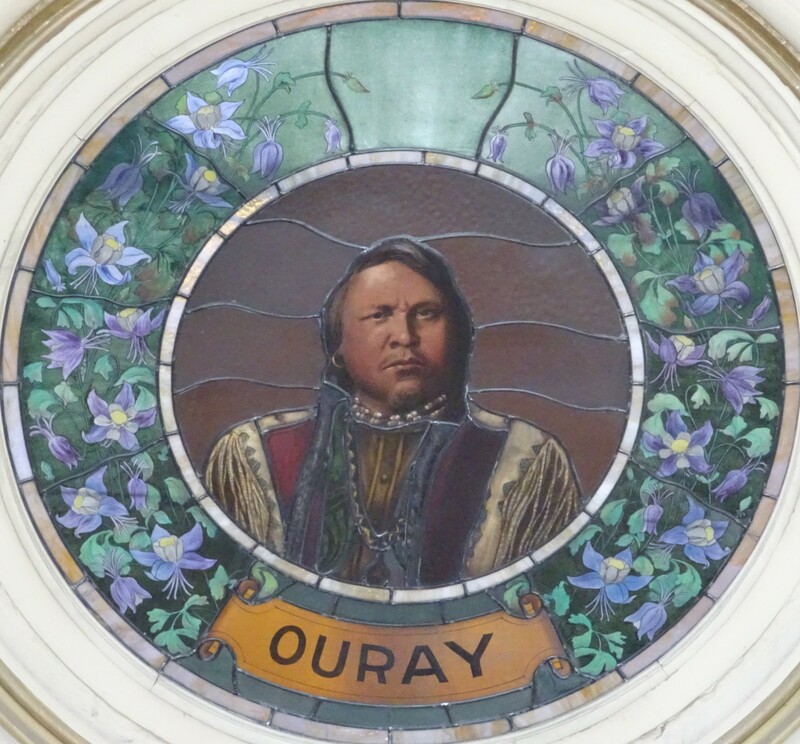 Chief Ouray was respected as a leader by both the Ute people and the American public. 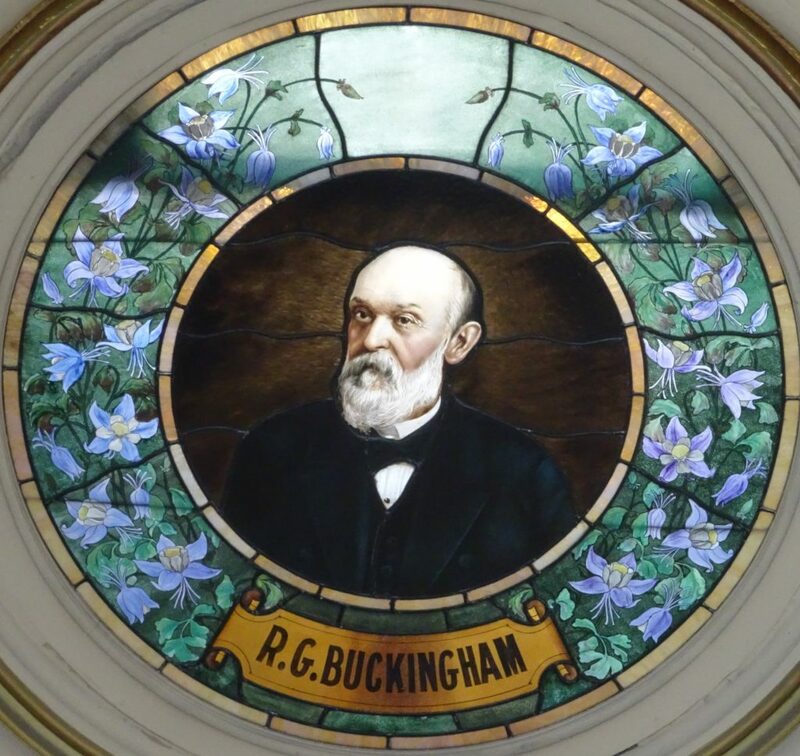 Richard Buckingham was a successful doctor and politician. He helped found the Colorado School for the Deaf and the Blind and the Denver Medical Association. 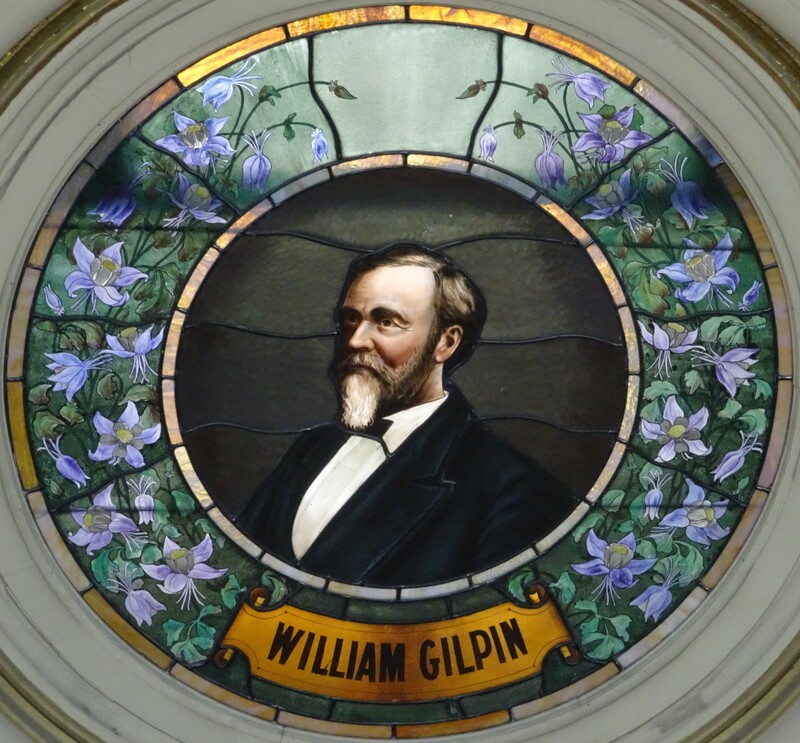 He served in the territorial legislature and as the 13th mayor of Denver. 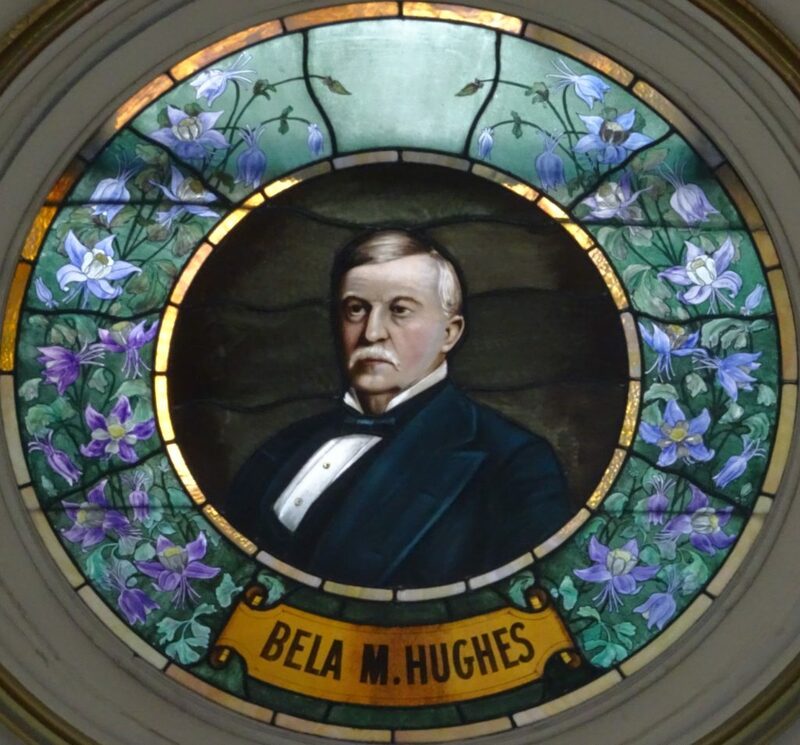 General Bela M. Hughes was a successful businessman and politician. 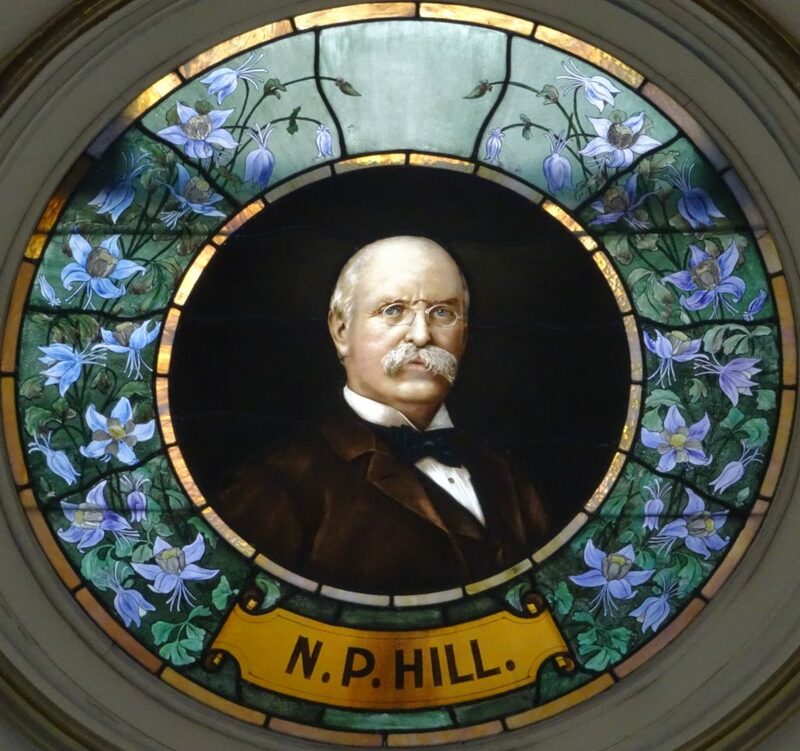 He was an early figure in the Colorado transportation industry and later served as the first president of the Denver Pacific Railway. 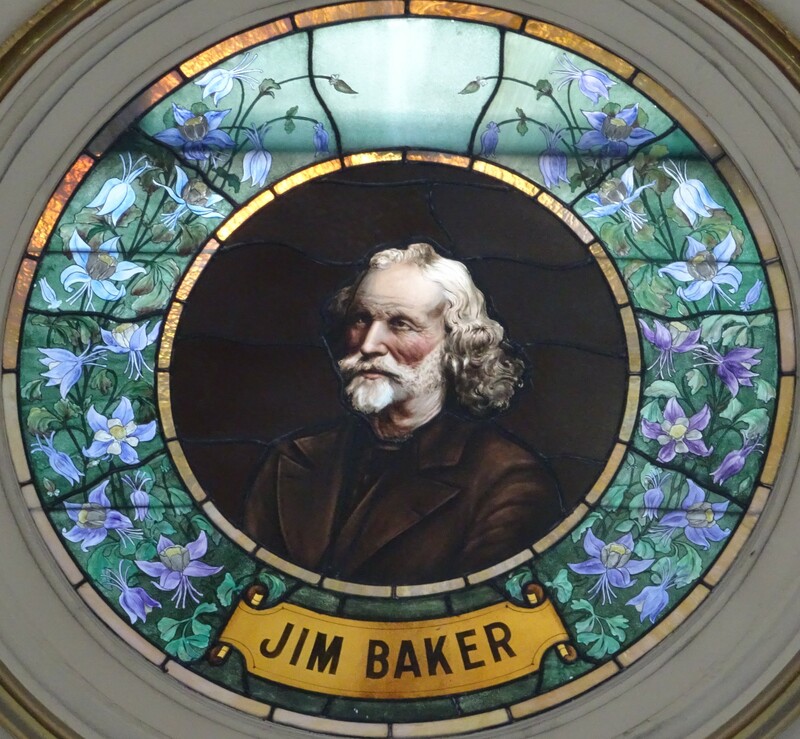 Jim Baker was an early pioneer and fur trader in Colorado. His role as an interpreter, chief scout, and guide for pioneers and the U.S. military made him a significant figure in the early days of the American West. 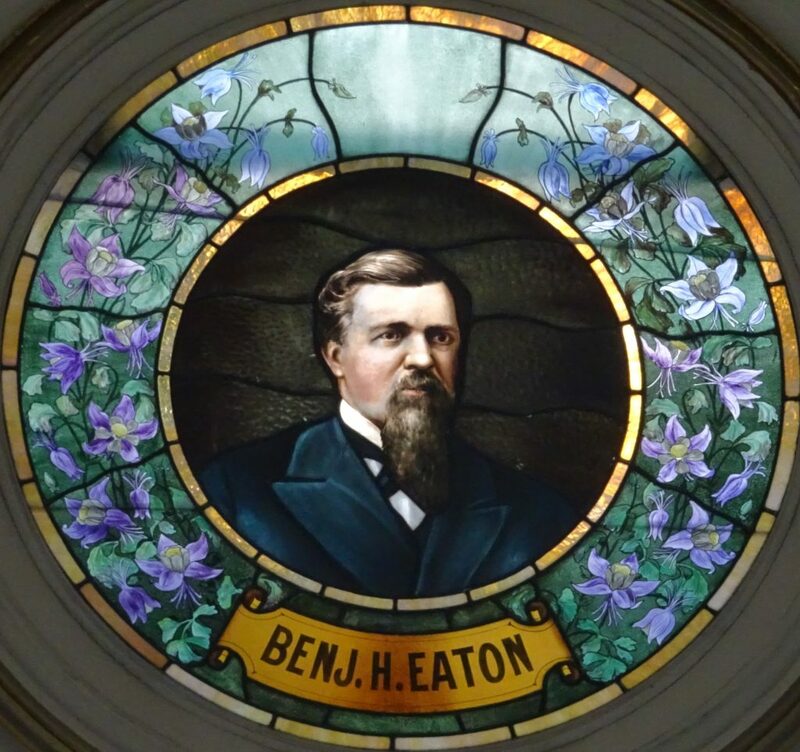 Benjamin Eaton was an early developer of large-scale irrigation and farming techniques in northern Colorado. He served in the territorial legislature and as a Governor of Colorado from 1885 to 1887. Alexander Majors was a successful freighter whose companies oversaw the transport of goods along pioneer roads to the western U.S. territories. He was co-founder of the Central, Overland, California, and Pikes Peak Express, also known as the Pony Express. 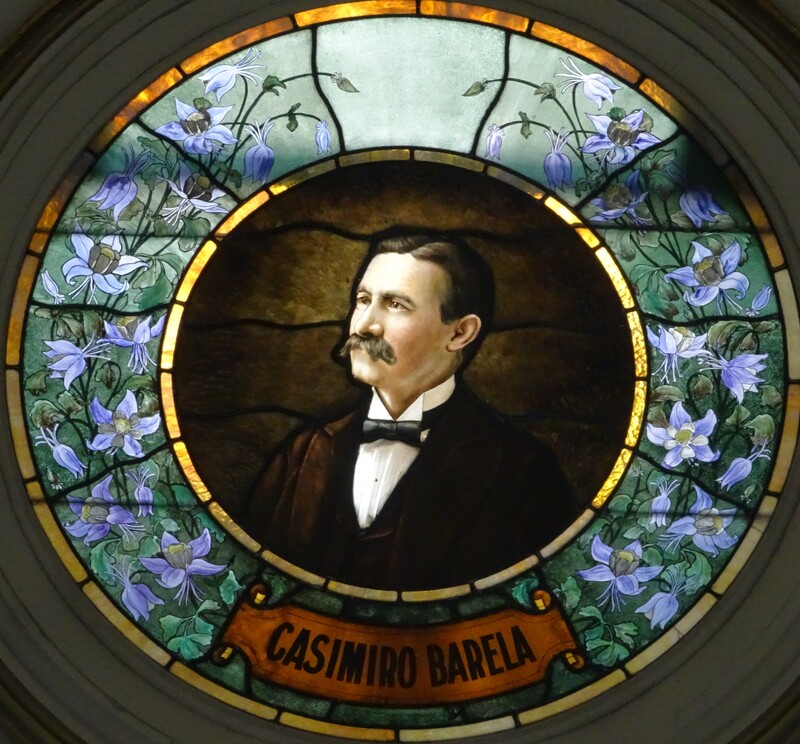 Casimiro Barela was a member of Colorado’s Constitutional Convention in 1875 and served in the state legislature for 25 years. He was an early advocate of Spanish-speaking settlers and was revered as one of Colorado’s best livestock men. 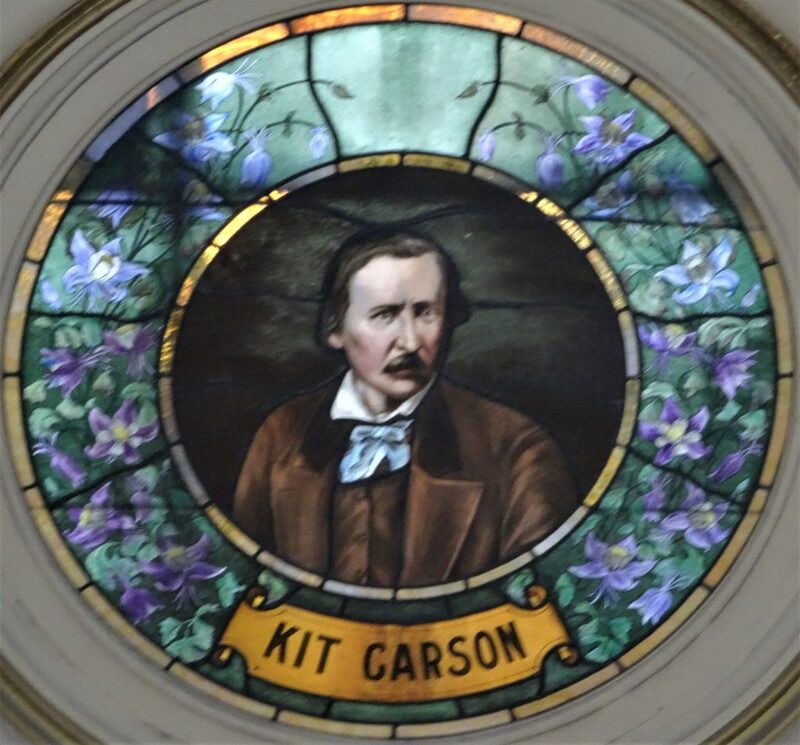 Christopher “Kit” Carson was a fighter, soldier, fur trapper, and guide for early pioneers and explorers. His reputation was galvanized by dime store novels that made him a national hero and symbol of the American West. Nathaniel Hill was a chemist who studied smelting techniques before opening several smelting operations in Colorado. He served as the U.S. Senator from Colorado from 1879 to 1885. Frances Wisebart Jacobs was a prominent figure in local charity organizations. She helped establish the state’s first free kindergarten, National Jewish Hospital, and was a founder of the United Way. 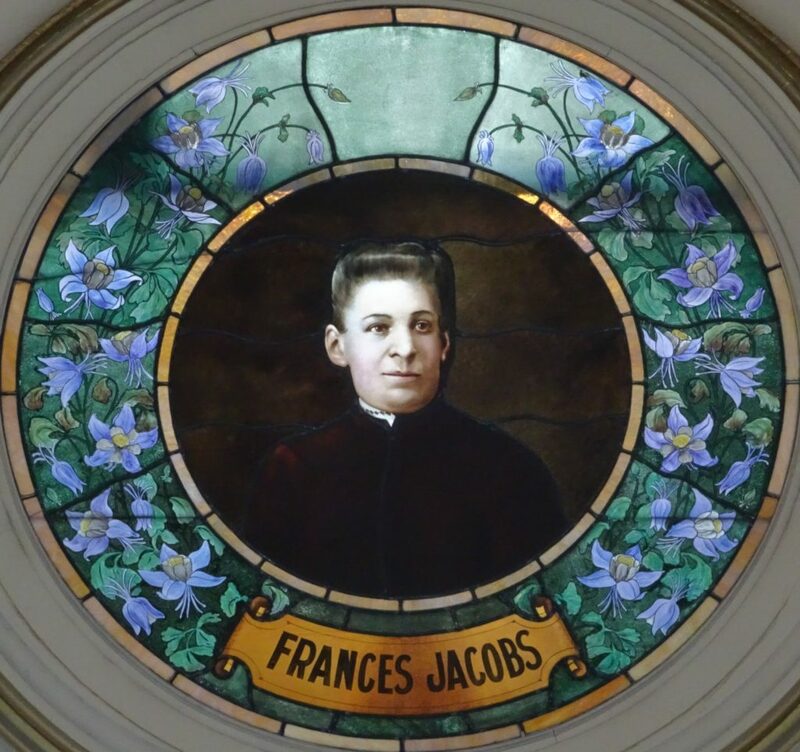 Jacobs is the only woman represented in the Hall of Fame. John Evans was appointed as the second Governor of the Territory of Colorado in 1862. He was forced to resign in 1865 following the Sand Creek Massacre. 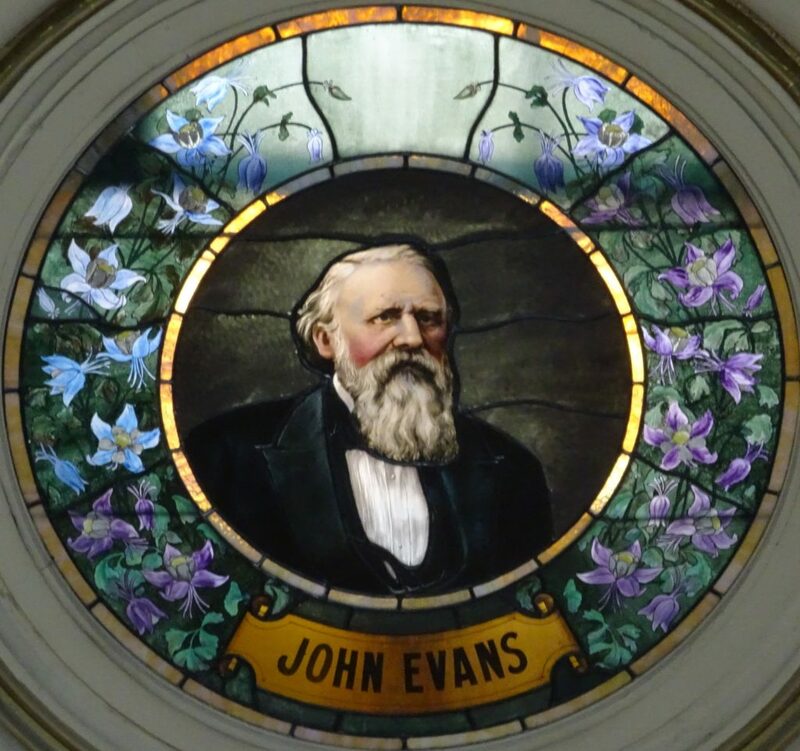 Evans was a founder of the University of Denver and remained a prominent figure in Colorado until his death. Descriptions from the Colorado State Capitol plaques in the Hall of Fame. History of the Capitol, https://www.colorado.gov/pacific/capitol/history-capitol . Colorado Historic Newspapers Collection, Herald Democrat, November 10, 1894, https://www.coloradohistoricnewspapers.org/cgi-bin/colorado?a=d&d=THD18941110.2.40&srpos=4&e=01-11-1894-01-12-1894–en-20–1–txt-txIN-Capitol%2c+occupied——-0-# . All photos by J.v.L. Bell. This entry was posted in 1910 and tagged capital, Colorado, hall of fame, stained glass portraits. Bookmark the permalink. Thank you for posting, “Colorado Capital’s Hall of Fame.” I was very disappointed with the few images on the State’s website for the capitol. I am building a new website InColorfulColorado.com and would like permission to use your images as I prepare (2019) stories on each of these pioneers and their backgrounds. I would also like permission to use the same images for several stories (2019) about our capital. I take over 20k photos a year with my LG phone and tablet and older Canon’s. the Canon’s don’t catch the images like yours. I’m looking forward to reading your many other posts. I am writing a book on the Smoky Hill Trail. 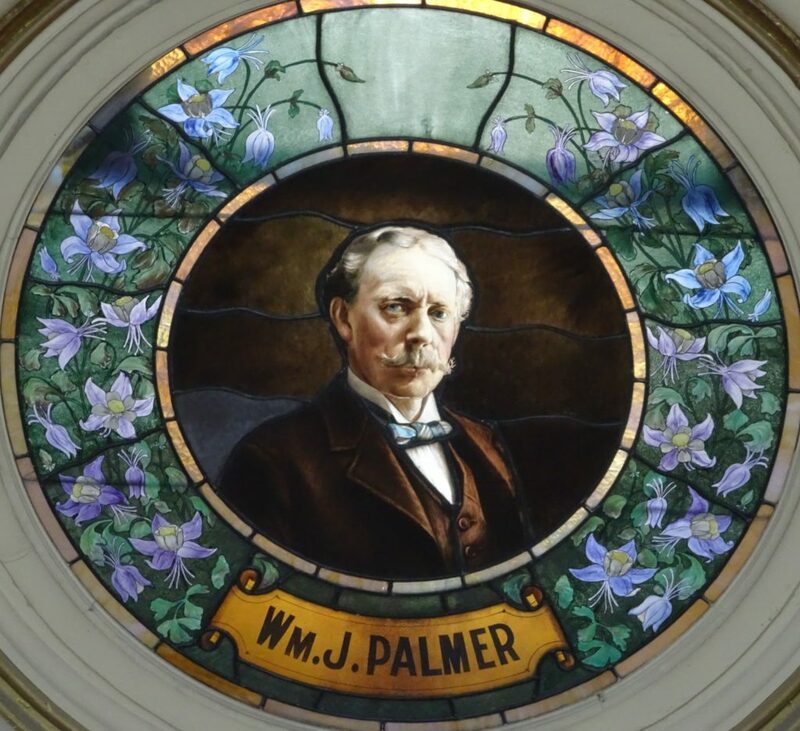 I would like your permission to publish four of your State Capitol stained glass images: Alexander Majors, William Palmer, Bela Hughes, and Kit Carson. They were all important in the transportation history of Colorado.